One pan meals are so great for getting dinner on the table in a hurry! This easy one pan sausage and veggie dinner recipe is so tasty that even your picky eaters will love it, and the clean up is a breeze! Preheat the oven to 400 degrees F. Line sheet pan with parchment paper or foil for easier cleanup (optional). Slice the baby red potatoes in half. In a small bowl, mix together all of the seasonings: the dried basil, thyme, oregano, paprika, onion powder, and salt + pepper (Salt and Pepper to taste, I used about ¼ teaspoon of each). Mix together. Place the red potatoes and baby carrots on the sheet pan. Drizzle 2 tablespoons olive oil and half of the seasoning mix on top. Gently Toss to combine and place in the oven for 20 minutes. Prepare the asparagus by trimming the ends and cutting into 2 inch pieces. Thinly slice the yellow onion and coin the sausage. 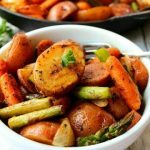 Remove the potatoes and carrots from the oven and push them to one side of the pan using a spatula. On the other side add the chopped asparagus, sliced onion, sausage, and minced garlic. Drizzle the remaining 2 tablespoons olive oil and remaining seasoning mix. Toss to combine and then toss those ingredients with the potatoes and carrots. Bake for another 10-15 minutes or until veggies are roasted to your preference. Top the dish with freshly grated Parmesan.